UFC two division world champion Conor McGregor is even more confident after the switch to lighter gloves for his Saturday night fight against undefeated five division world champion Floyd Mayweather. Mayweather had nearly all of his 49 professional wins using eight-ounce gloves, which may accentuate one of his advantages - his hand speed. McGregor preferred the lighter gloves since he is used to the fingerless, four-ounce gloves typically worn in MMA. While most pundits have McGregor, who has never boxed professionally, as a heavy underdog, the Dubliner said he was determined to prove the doubters wrong. The Irishman said his gruelling preparations for the fight would enable him to triumph no matter how the fight develops. 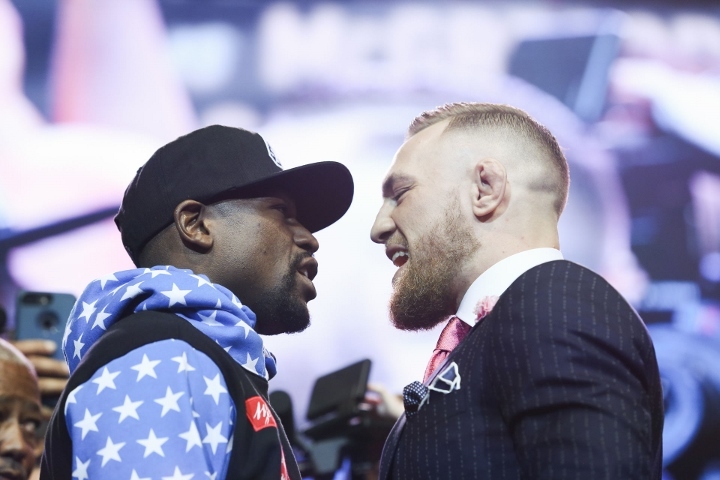 Dana White, president of the Ultimate Fighting Championship (UFC), followed McGregor on the conference call and predicted the fight could even threaten the reported $600-million haul from the Mayweather-Manny Pacquiao 2015 showdown. McGregor has been involved in numerous big events for the UFC. He believes that will give him some type of advantage when he steps in the ring with Mayweather. Should McGregor pull off an unthinkable win, it would be the biggest upset in boxing history. “I’ve been in this life a long time. I’ve had these mega-fights, I’m under this spotlight a long time,” McGregor said. “A lot longer than all his other previous opponents. That’s why he’s probably feeling that will come to his aid in there but I’ve experienced this time and time again. Why the hell are you guys to going shell out a $100.00 to watch this **** when you can stream it ? Now GGG/Canelo might be worth paying for . The only face that is going to change is McGregors after Floyd lights him up for 12 rds or however long it goes. "I've been in this life a long time. I've had these mega fights. A lot longer than all his previous opponents..." Errr... No, in a word. I'll just pop Pacquiao and DLH in there for now, just to call BS.